Forgive us for being so blunt. 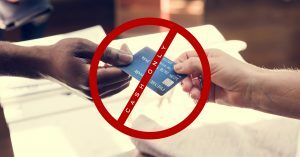 But in 2018, there’s simply no good reason to operate a cash-only business. Canadians nationwide have proven that they much prefer to pay for their purchases with either their credit cards or their debit cards. At the very least, they appreciate having the option to decide whether or not they want to use cash. The truth is that the majority of today’s consumers don’t even carry cash on them. Not only does it help them to avoid loss or theft, but going cashless enables shoppers to shop to their heart’s content. Cash is limiting. Quite obviously, an individual can only spend up to the amount of cash on his/her person if cash is the only payment option. With the ability to use credit or debit, however, a customer can be more flexible with his/her spending. By only accepting cash, you leave your business susceptible to fraud. It’s no secret that cash has been counterfeited for as long as cash has existed. If you only accept cash, you run the risk of being ripped off. Counterfeit bills obviously have no cash value. If you’ve mistakenly accepted such bills, you’re stuck without your “sold” inventory and are forced to take a loss. By accepting plastic, you guarantee that your business will have earned a profit from the sale. You’re inconveniencing your customers by denying their cards. As mentioned, most Canadian consumers simply prefer having payment options. And one of the top reasons for this is because it’s much more convenient to place all purchases on one account. Whether it’s their credit cards or debit cards, shoppers have proven that they enjoy the accounting ease that comes with being able to see all of their purchases on one bill. Paying with cash doesn’t exactly help for good bookkeeping. Here’s the bottom line: Your cash-only business is hurting your bottom line! At Canadian POS, we highly recommend the Poynt Smart Terminal for all of your payment processing needs. For more information, please don’t hesitate to call us at 1-877-748-2884 or email us at info@cdnpos.com.